A Lady Reveals Nothing: Sunday Favorites: "You Can Stop it Now Beth, Nobody's Looking at You." Sunday Favorites: "You Can Stop it Now Beth, Nobody's Looking at You." "YOU CAN STOP IT NOW BETH. NOBODY'S LOOKING AT YOU." I went with some friends to go and see the Walker Art Center's last installation of Music and Movies in the Park. Barrio restaurant in downtown Minneapolis sets up their food truck at these events, and it was there that I had my Second and Third Dinners this evening. 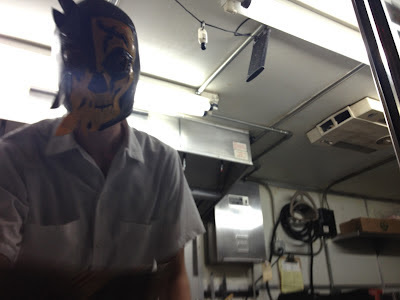 As I approached for Third Dinner, I noticed that the food truck employee was wearing a "Nacho Libre"-type mask and was yelling "HOLA!" at the customers in a "BOO! (scared you)"-type fashion, and I was really not into it. "I SEE YOUR DUMB MASK. OK?" ...and then I took this photo without his permission.